What got you started in Jiu Jitsu? I was bullied as a kid and I have been always been terrified of physical confrontation. Jiu Jitsu destroyed all that. BJJ turns out to be the most difficult, most physically challenging, most brutal hand to hand combat martial art. 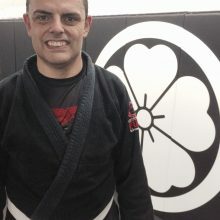 I knew all this going in and I wanted to be successful at something that no one in my family (or among my non BJJ friends) has ever done before. I wanted to prove to myself that I could do this. That I could learn to ignore fear, pain, ego, to become a fighter. I love the idea that when I step into the mat what happens next, whether I win or lose, I own it. Being alone on the mat with your opponent is the ultimate test of skill. No one will help you. Everything that happens, you make it happen. I was looking for a challenge and also for a martial art that relied on leverage, thinking and strategy, not just brute force. Also, most street fights I witness always wound up on the ground … so since most fights end up on the ground, whoever knows how to fight on the ground has the best chances of winning. IT management: Computers, meetings, writing emails and politics. What do you like most about Jiu Jitsu? Chris says that the mat is like a mirror. The mat doesn’t lie. On the mat the true you comes out. I knew this when I started BJJ. I knew that by doing BJJ I would be able to look at my true self. I looked and I saw and I hated what I saw and I used BJJ to change what I didn’t like. I am using BJJ to discover the side of me that gets in my way (on the mat and in real life) and every time I step on the mat I defeat it and I make that side of me weaker and smaller. Why did you choose Sakura? Because of the people. Chris, Alex, Matt … everyone I train with. I have been incredibly lucky to find Sakura. I could never hope to find such an amazing group of people all in one place. The people I train with is what makes Sakura and BJJ special. Never found a better, more honest, more generous, more honorable group of folks anywhere. Probably never will again. What do you like to do outside of Jiu Jitsu? What you’d you say to someone who is nervous about taking their fist class? At Sakura, there’s no need to be nervous. New people are welcomed with open arms. We love getting new people in the school … getting more people involved with BJJ. Fitness level and skills are irrelevant. You will acquire those as time goes by and as you keep coming. No one will judge you. No one will force you to do anything you don’t want to do. Everyone trains to help themselves and others improve. Nobody will think “oh here comes to newbie … waste of time”. We all started from a first lesson. We all walked on the mat as a white belt for the first time and no one (at Sakura) forgot that. We all relate and if anything we feel the excitement for someone that is about to discover one of the best martial arts and best schools out there.